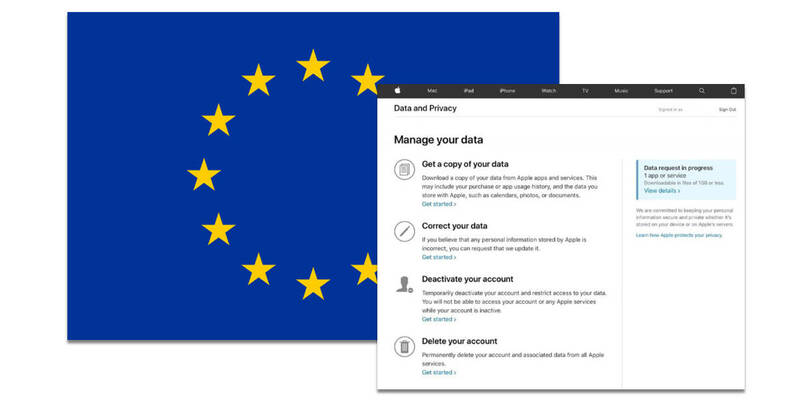 Apple has a new Data and Privacy web page for European Union residents. The updated page brings iPhone and Mac maker in line with the EU’s General Data Privacy Regulation, or GDPR, laws. Apple’s new data and privacy page went live on May 23rd, just two days before the GDPR May 25th deadline. The page lets users download a copy of their data stored or managed through iCloud, correct personal information, and delete their account. GDPR was enacted in 2016, but doesn’t go into effect until May 25th, 2018. The law is intended to give EU residents control over their online information and data, requires explicit consent to let websites keep personal information, and limits how companies can use information collected online. For now, the personal data download options are available only for European Union residents. Apple plans to make the new Data and Privacy page options available to everyone later this year. Until then, Apple has a separate page for requesting your personal data download.